Muslim Police Officers in the UK, Complete With Their Own Islamic Uniform. To view our related articles on Muslims in Britain, click here. Recently we posted an article showing how the number of Muslims in British jails is rapidly rising, today I found a shocking census report from the UK, showing that in 20 years Britain will have a larger Muslim population than Kuwait and one in ten Briton will be Muslim. My theory is, the current census claim that Muslims make up 3% – 4% of Britain’s population yet look at the chaos, crimes and terror attacks the current population have led.. when the Muslim population reaches 10% or 20% of Britain’s population, what situation will Britain be in? That same theory applies to all European countries who have allowed mass Muslim immigration and are suffering the effects. 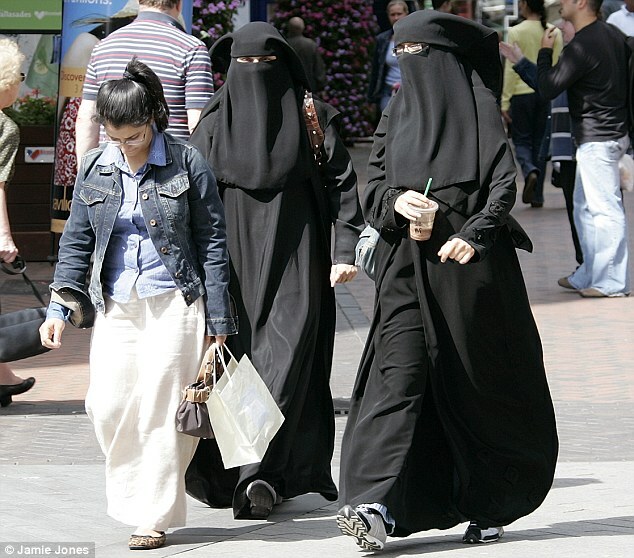 The Muslim population in the UK will almost double to 5.5million within 20 years, it has been claimed. Immigration and high birth rates will mean nearly one in ten Britons will be Muslim by 2030, according to a worldwide study about the spread of Islam. And the forecasts mean Britain will have more Muslims than Kuwait. From 1990 to 2010 the number of followers of the Islamic faith around the world increased at an average rate of 2.2 per cent annually. Last year there were 1.57billion around the world. The British increase in the Muslim population from the current 2.8million will be mainly driven by immigration, according to figures prepared by a Washington think tank. Projections by the respected Pew Research Centre said the 40 years between 1990 and 2030 will see a fivefold rise in Britain. In 1990 there were 1.1million Muslims in Britain, representing two per cent of the population. By last year that figure had risen to 2.8million, or four per cent. By 2030 the number will hit 5.5million – eight per cent of an estimated 68million population, Pew researchers said. 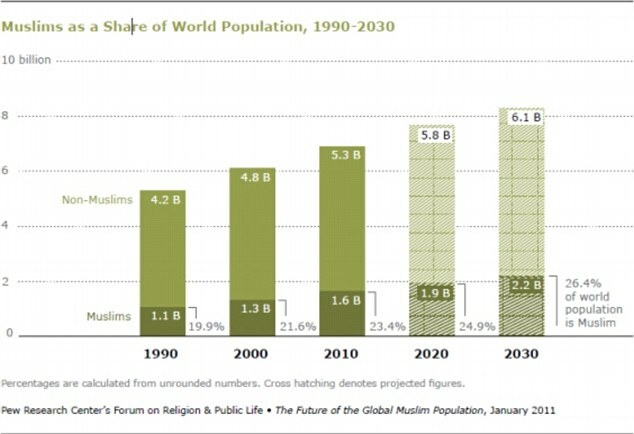 In the U.S., the number of Muslims will also double by 2030 – rising to 6.2million from 2.6million today. But the percentage of Muslims will remain lower than the UK because the total population is five times bigger there, with around 300million at present. Last May, official figures showed that there could be 70million people in Britain by 2029 – largely fuelled by the migrant boom. By comparison, in the same year the Arab state of Kuwait is expected to have a Muslim population of 3.6million, it forecast. The report said one in four migrants to the UK are Muslims. In Canada, the number of Muslims is set to nearly treble to 2.7million in 2030 from 940,000 at present, the study found. ‘The greatest increases in the Muslim share of the population – driven primarily by continued migration – are likely to occur in Western and Northern Europe, where Muslims will be approaching double-digit percentages of the population in several countries,’ it said. Britain has long had high immigration levels from some Muslim countries, notably Pakistan and Bangladesh, and in recent years has seen high numbers of migrants from Islamic parts of Africa. The Pew report also cited high birth rates. It said that ‘generally, Muslim populations tend to have higher fertility rates than non-Muslim populations’. It added: ‘A larger share of the Muslim population is in, or soon will enter, the prime reproductive years between the ages of 15 and 29. The number of Muslims in the U.S. is expected to double in the next 20 years to 6.2million from 2.6million today. There will be as many Muslims in America as there are Jews or Episcopalians today, if the predictions are correct. Currently 0.8 per cent of the U.S. population is American, but by 2030 that is expected to rise to 1.7 per cent. The reports authors warned that political change in the U.S. could limit immigration. The study used past population changes, migration figures and fertility rates to estimate changing Islamic populations. 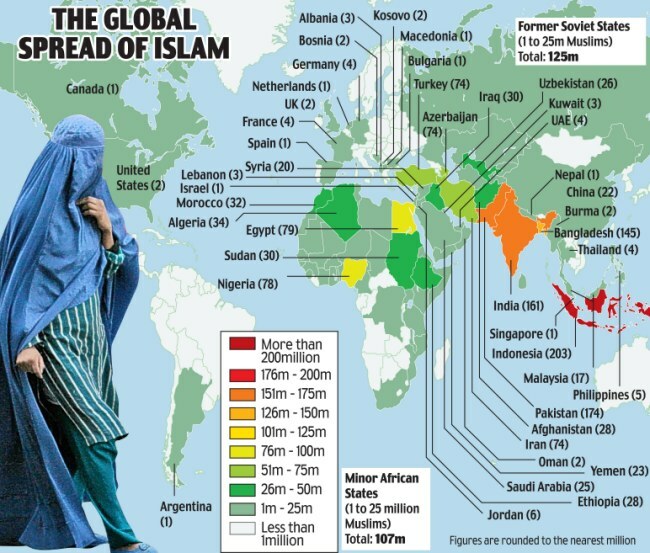 By 2030 Muslims will make up 26 per cent of the world’s projected population of 8.3billion, up from 23 per cent of the estimated 2010 world population of 6.9billion, it said. Those figures represent an increase from 1.6billion in 2010 to 2.2billion in 2030, a rise of 35 per cent. The analysis comes amid continuing debate over the views of Muslims in Britain and attitudes towards them. The study was based on past demographic trends and estimations on what will happen to them over the next 20 years. Last week Tory Party chairman Baroness Warsi said prejudice against Muslims is seen as normal and called for people to stop categorising them. This entry was posted in Islam in Europe and tagged human-rights, islam, religion. Bookmark the permalink. Baroness Warsi, no such trouble ever came out of Ashrams! Come to Israel, we know how to deal with them, one day Europe will wake up and realize it become another muslim nation, that day will probably be too late. Europians won’t be able to do to the Muslims what they done tothe jews (and to be honest, they deserve what they getting, they killed the jews who contributed to Europe and the void that the jews left the Muslims filled). Now the muslims will show everyone on Europe how they taking over the Christian’s land after 2K years and force Europians to convert to islam or die. good work Europe. let’s see what will you do after you support them and condemned israel for protecting against those ppl who spread hate and evil. We must make sure our European Governments are not Muslims and to keep Muslim populations under control. European Countries need to be protected and to stay intact. But some Muslims are trying to make Europe including England, France and Ireland to become the Islamic statue countries. It is very dangerous for Christians and common people.